What do John Barrowman, Victor Garber, and John Noble have in common? Besides appearances in the Arrowverse—the shared fictional universe of Arrow, The Flash, and Legends of Tomorrow—wicked quick wit that makes for a fun panel, and good ole’ song and dance chops, they all were on hand Friday afternoon in Hyatt Centennial II-III for the “Arrowverse Cast: Heroes and Villains Summit.” Sadly, Brandon Routh, who has played Ray Palmer/Atom on all three shows, could not join. Barrowman, a Dragon Con staple, turned up wearing shirt of himself wearing the infamous Tardis dress from Cons past. He was, as the shirt declared, fabulous, and gleeful in reliving his turn as the villain Malcolm Merlyn, and his early years on the stage. John Noble—known in the sci-fi world for many roles, including as Walter Bishop on Fringe—talked about appearing as himself in the Arrowverse as well as voicing Mallus. 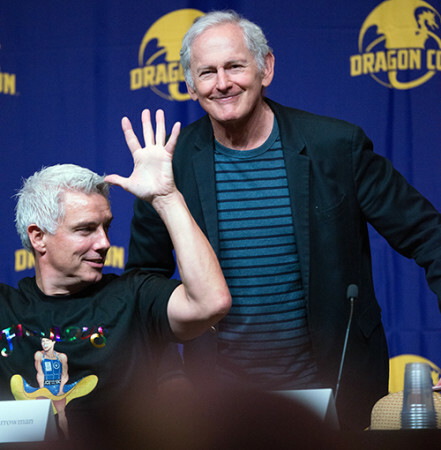 Victor Garber, a first-time Dragon Con guest known for Alias and as Dr. Martin Stein, primarily on Legends, never missed a beat in playing off Barrowman’s often flamboyant jibes. Noble had fun describing the improv he did when filming the Legends episode titled “Guest Starring John Noble,” which involved surprising the camera men with a chicken-head puppet reciting his lines, which did not make the final cut. Upon hearing about the “prank,” Barrowman—a known prankster—quipped, “I think we should work together. That’s the kind of sh!t I do.” Indeed, he then talked about pranking his cast mates, or rather catching people off guard by doing something wild on a final take. When asked who in the Arrowverse they would love to come back as, Barrowman declared “Victor’s other half!” but played against Robbie Amell (who was Ronnie Raymond/Firestorm on The Flash). “That’s very, very painful. Hurtful,” Garber chimed. “Not if you cough,” Barrowman shot back. When asked about the reveal that Merlyn was Thea Queen’s father on Arrow, Barrowman described the moment his husband—Scott Gill—actually hatched the idea, instead of making him Oliver Queen’s father, which felt “very Darth Vader.” He would not, however, divulge the details of his photo op session attire, saying only that the look was created specifically for Dragon Con. All three men talked about the benefits, and drawbacks, of working on episodic shows, including cycling through multiple, and sometimes “green,” directors who want to reinvent the wheel or don’t trust in the actors’ ability to live in the characters they’ve been embodying for years. “Here’s the thing,” Garber added, “Some directors are really good. Some aren’t.” And, he doesn’t have a problem correcting the bad ones, who are bound to listen to an actor of his gravitas and caliber, especially when he has the respect of the crew and cast behind him. When asked about playing alternate, or multiple versions, of their characters. Noble said he loved it. “It’s challenging as hell,” but has great rewards. All three men are also accomplished, and well-known, stage actors, which made it a no-brainer for Barrowman and Garber to participate in the musical episode of the Arrowverse. “If you don’t work me in,” Barrowman, who did theatre for 18 years (and describes himself as a mover, not a dancer) before TV, told the powers-that-be, “I’ll be upset. And you’d be stupid.” He also enjoyed ribbing actor Darren Criss for messing up the dance sequences. During Barrowman’s performance in the play The Fix, directed by Sam Mendes and which netted him an Olivier Award nomination, he was told to “do something really outrageous,” which is a dangerous request when dealing with John Barrowman. He had learn while researching the role that heroin addicts sometimes shoot up in their crotch when they can’t find vein. So, that’s what he did, which Mendes loved. He was told not to do it next performance. Garber, who appeared in the film version of Godspell and recently in Hello, Dolly! with Bernadette Peters on Broadway, said he’s always asked to sing, but that he needs a lot of rehearsal. The stage has brought him pure joy and also pure terror, which is what he felt when playing Macbeth, which he called “life changing” and thrilling. The essence, Noble said, is the same—whether it’s TV or stage or film—for finding a character, but that he loves the speed of TV and that it was most challenging, as a father, to get into a vulnerable state to play a man in The Return of the King who was prepared to kill his sons. Lucky for us, though, that Noble, Barrowman, and Garber can do it all: film, TV, and theatre. Drama, comedy, and action. It maximizes the chances, and times, we get to enjoy their many talents.